For readers, writers, teachers, and parents, that should mean something. And it's not that we should be cheering for books to be yanked off shelves, either. I'm the first person to raise their hand if there's a conversation about how some books are garbage, how I don't want my kids reading that, how I won't read such-and-such, for that matter. But I want the right to make those choices for myself and for my family. No one else has the right to choose for me. Based on the choices others have tried to make in banning books for other people's "good," censorship is a very dangerous road. A look at some of the most banned classics stunned me. It includes several of my all-time favorite novels. It also includes some I hate, but I don't think they should be banned. Children's books in particular tend to get under fire, as well-meaning (at least, we hope) adults put their noses into parents' business and make the parenting decisions on our behalf. I have a special place in my heart for Dav Pilkey's work. They were the first "real" books my son ever read on his own, cover to cover. Sure, they have lots of goofy potty humor and misspellings. So what? They got my son reading. He laughed and had fun and advanced to harder and deeper books (without potty humor and misspellings!). Today he's a high-school junior who still reads a lot (much more advanced stuff). He has a great vocabulary, is a great writer, and, in my totally unbiased opinion, is a brilliant student. Had I taken away his favorite books back when he was six and insisted he read Tom Sawyer when he simply wasn't ready for a classic like that, I think that today he'd hate reading and wouldn't have the academic success he has today. And that would be a travesty. One of my favorite posts about Banned Books Week is by Dan Wells, a great writer and a friend of mine. Read it. Here. Now. Then go check out some lists of banned books . . . and then be really rebellious and read one. I'm betting you already have. On last week's Word Nerd Wednesday, Jordan McCollum made a comment about how the "needs washed" usage can be considered standard if you live in an area where it is, well, standard. We exchanged some emails about what constitutes "standard" and acceptable as far as English goes. I don't want to put words into Jordan's mouth, and she can always write about her opinion on the issue, but I thought the topic was worth addressing in a WNW post. Here's my basic opinion on standard English and the "rules," keeping in mind that while I love language and am a total nerd about it, I am not an expert, nor a linguist. And Jordan has studied linguistics. However, my dad is a linguist (I think word nerdery is genetic). We talk about this kind of stuff a lot, and I think it's largely thanks to his influence that I don't get overly annoyed by a lot of so-called grammatical mistakes in conversation or other casual settings, like emails and blog posts. I don't even care that on Twitter, there's a search feature for "Who to Follow" instead of "Whom." For that matter, sometimes I find myself enjoying differences in speech patterns, as it's a peek into a different culture. There was the time Dr. Oaks taught about how some people pronounce an R sound after an A, resulting in words like warshed instead of washed. I'd never heard anyone pronounce it like that, but lo and behold, just a few months later, I met a family who did. They warshed their warsh rags in the warshing machine. I was fascinated. Dr. Oaks was right! How cool. Jordan has a point that what's acceptable usage varies from area to area. I'd say that since such a huge portion of the world speaks English as a native language, you'll find variations within every country (and state) that speaks English. There's bound to be a wide range of what's considered okay in any one place. On top of what's considered standard, most people speak in several "registers," meaning they slip into and out of various ways of talking depending on the context. So I'd use far more formal language when teaching a writing workshop than I would when chatting with my sister. Another example: While we were dating, my husband mentioned how differently I spoke when I was around my high-school friends. At first I balked at the idea, saying that I didn't just change who I was when they showed up. But I watched myself after that, and his observation was right. My group of friends from that era had its own tone and even slang. It was natural to slip into it when around them and then slip out of it like a light jacket when I walked away. So natural I didn't notice I was doing it. I've heard of corporate professionals who speak one way most of their days but then visit their parents back in the Bronx (or the Deep South or some other place) for Christmas and by New Year's, they're talking with a heavier accent again and using colloquial phrases they'd almost forgotten about. This is normal. This if perfectly fine. The standard exists for a reason. It's a collection of agreed-upon rules that marks what is expected of educated people in our culture. If you are educated, you're expected to know these rules. In a social (and even economic) sense, standard English is the currency we use in our interactions. That means it's valued. If you decide not to use it, fine. Just know that your language may prevent you from using the same currency, communicating (and succeeding!) in a way others who do use the standard will by default. Because the standard is such a huge currency, it's a good idea to follow any rule in a situation that values the currency. If you used their as a singular possessive pronoun in a resume, you may know that it's gradually becoming accepted usage, but a potential boss may not, thinking it's still a standard rule. The potential employer, knowing the currency of standard English, may well assume you don't know correct grammar and therefore aren't as smart or capable as you really are. Just like you'd never wear a swim suit or pajamas to a job interview, you need to use the right language in the right settings to be taken seriously. I've mentioned this idea before, particularly how a student called Dr. Oaks out on it, asking why we couldn't just turn in our papers using our regional dialects if they aren't inherently any more inferior or "wrong" than the standard. Dr. Oaks just laughed and basically said, "Because you're at a university, that's why. Part of your education is to learn how to communicate using the standard dialect and then prove you know it in your writing." In today's technological world, where pretty much everyone is required to communicate with the written word in virtually any job (even at McDonald's), knowing the rules and expectations goes a very, very long way. As we shoot forward into the electronic future, it's going to be more and more important for our kids to have the currency they need to succeed, and that means knowing the standard language so they can communicate effectively, be taken seriously (as smart and capable! ), and, frankly, to get ahead in life. I've seen too many cases where someone uses their regional dialect in a setting where it simply isn't appropriate or welcome. The person is brushed off as incompetent or even unintelligent. Sure, you can always fight back by saying that the people who judge you based on your language are wrong, narrow-minded, and not so smart themselves. But being right isn't going to get you the job. Today I get to interview fellow LDStorymakers member and writer, Abel Keogh, who has a new book out. He's a copywriter by day, and a creative writer by night (or by free time, as the case may be). At the age of 26, Abel Keogh unexpectedly found himself a young widower. When he decided to starting dating again, he looked in vain for resources that could help guide him through the dating waters and open his heart to someone else. He found nothing. As he began blogging about his experiences, women dating widowers began emailing him asking for his thoughts on their situations. As the numbers of emails increased, Abel started writing his own dating a widower advice column. 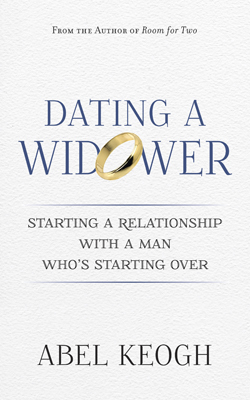 In Dating a Widower Abel shares the knowledge he’s learned from his own experience and the most common issues he’s seen from hundreds of emails from women dating widowers. Abel is also the author of the memoir Room for Two—the story of the year of his life following his late wife’s suicide—and the novel The Third. He and his wife Julianna are the parents of three boys and two girls. Since I get this a lot, before we get into the interview, let's start with his last name: It's pronounced KEY-OH. 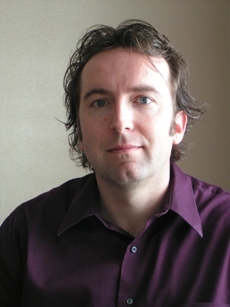 AL: Professionally you’ve worked as a technical and marketing writer for hi-tech organizations. You’ve also published a memoir, a novel, and now you have a self-help book. What is your favorite type of writing? Why? AK: I really enjoy the challenge that comes with fiction. Creating new worlds, believable characters, and complex plot is fun but difficult. Non-fiction is easy for me to write. I’m not sure why—maybe it has something to do with my professional background. But being able to write a good novel is an absolute thrill. I’m in awe of those writers who can do it well. 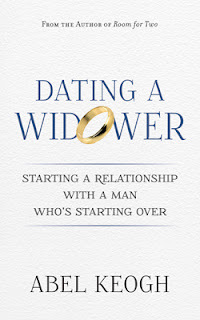 AL: What prompted you to write Dating a Widower? AK: I’ve received hundreds of emails from women dating widowers over the last five years finally and realized that there really was nothing in the market to help these women—especially form a male point of view. I started to meet the demand by writing a weekly column but my readers kept asking for a book so I took a couple weeks and wrote one. AL: You’ve published two books traditionally with a small press and received a publishing contract for Dating a Widower. Why did you turn down the contract and decide to self-publish this book? AK: Turning down the contract was a difficult decision—one that took over a month to make. However, the more I thought about it, the more I realized I had a corner on the market and a fairly big audience that was eager for the book. I wasn’t sure that a publisher could reach the audience any better than I could, so self-publishing seemed like the best option. I knew going at it on my own was going to take a lot of extra work but had the potential for lots of reward that wouldn’t come going the traditional route. As of now, I’m happy with my decision. AL: What is your typical writing schedule like? AK: Most of my writing is done at night after the kids are in bed. On the weekends I can usually sneak in a few more hours early in the morning. I wish I had more time, but there are responsibilities that come with being a husband and father that take priority. AL: What are some of the differences you’ve found in writing a book of non-fiction versus fiction? AK: Unless you’re writing a memoir, there are a lot of things you don’t have to worry about when writing non-fiction. For example, you don’t have to worry about plot twists or whether there’s enough tension in the plot to keep the reader turning the pages. At their core, however, fiction and non-fiction both need a solid outline, clear concise writing, and meet the needs of the target audience in order to succeed. AL: What challenges does self-publishing bring with it? What are the benefits? AK: The biggest challenge is producing a product that just as good, if not better,than a regular publisher. From what I seen most self-published books still have a lot of quality issues such as typos and other mistakes any competent editor would catch. In addition most have poorly designed, amateur-looking covers. If you’re going to self-publishing and want to succeed, the packaging and the product has got to be first-rate. The biggest reward, so far, is seeing the final product and being very pleased with it. I believe I did as good a job as any publisher could have done with it. The final verdict, of course, will be up to the book’s target audience. After looking at the sales numbers in a couple months I should know whether the packaging and content did their job. AL:What's been the biggest surprise about the self-publishing process? AK:The amount of work involved. I knew it was going to be time consuming but I didn’t realize how time consuming. I had to put a fiction project completely on hold for two months in order to get Dating a Widower done right. AL: What are the most common questions you get from women dating widowers? AK: Lee Child, Michael Connelly, and Robert Crais. AK: There’s never been a better time to be a writer. The number of options and opportunities that are available to authors today are simply unbelievable. Authors can go the traditional route, self-publish and still get their books distributed through the world’s biggest bookstores, or do both. The eBook world has also revived the short story market—something I’m personally glad to see. How the new world of publishing will sort itself out remains to be seen, but I’m optimistic that, for authors, it’s only going to get better. Contact Abel via Twitter: @AbelKeogh, on his Facebook PAGE, or visit Abel's blog here. Recently, Mignon Fogarty (known as Grammar Girl, the author of the book I talked about in last week's Word Nerd Wednesday) asked her readers on Facebook to help her pinpoint a geographical trend in speech. It's a quirk and (yes, I'll say it) an error that puzzles me, but I hear it often enough. I don't know where it hails from. I get the idea that it's particularly common the Midwest, but I've seen people use it who are from all over the place, from California to Florida and in between. A direct object is something a verb modifies, or refers to. Here, milk and candy are the direct objects. They're what the verbs (drank, eats) refer to. A refresher: What's a noun? A person, place or thing. A noun is NOT an adjective or a state of being. Granted, that's beyond silly. But it shows that a state of being, or in this case, a past-tense verb, simply can't work here. It doesn't make sense. You couldn't come up with another set of verb + direct object where a state of being works. Those just don't go together. See, now that works. Why? We aren't using a verb that requires a direct object. The sentence is constructed to explain the state of being the turkey is in, using the key word IS. So we don't need a direct object that the verb refers to. The turkey just IS. You can ask, "The turkey is what?" and the answer is clear: "The turkey is cooked." Or just say what needs to happen. NEED is a verb that requires a direct object. Refresher: a direct object is a NOUN, right? So: Ready for the quiz? The turkey needs . . . WHAT? 1) Add -ING to the end. The turkey needs cooking. 2) ADD "TO BE" before it. The turkey needs to be cooked. The car needs TO BE washed. Who needs TO BE tickled? The turkey needs TO BE cooked. I let some things slide with my kids, rules that are gradually going away and may seem antiquated (who/whom, can/may), but stuff like this is absolutely crazy-making to my ear. Up today: An interview with one of the coolest people on the planet, and a dear, dear friend. 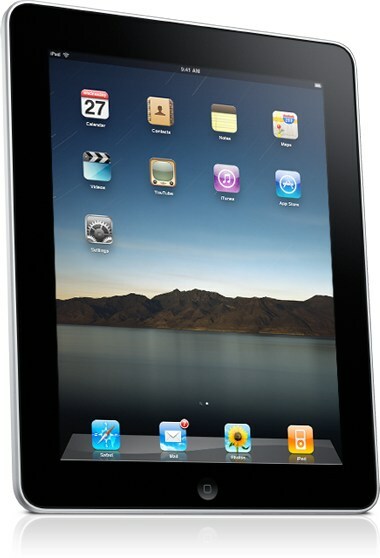 2) A contest to WIN an iPad. Fer reals, peeps. 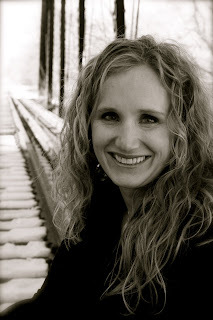 Josi S. Kipack hated reading until her mother handed her a copy of The Witch of Blackbird Pond when she was 13. From that day forward, she read everything she could get her hands on and credits her writing education to the many novels she has studied since then. She began writing her first novel in 1998 and never stopped. Sheep's Clothing (2007) won the Whitney Award for Best Mystery/Suspense. Lemon Tart, the first book in the Sadie Hoffmiller Culinary Mystery series, was a Whitney finalist in 2009. Josi currently lives in Willard, Utah, with her husband, four children, one dog, and a varying number of chickens. Additional notes from me: Josi's cell phone ring is the sound of chickens, and Josi adores chocolate-covered cinnamon bears. She's also one of the four authors (with me!) of the upcoming Newport Ladies Book Club series. AL: You started your writing career with issue-driven books (prescription drug abuse, internet predators, infertility, etc.). How is writing culinary mysteries different? JK: It’s a lot more different than I thought it would be when I started. For one thing, this was the first time I’d ever written a book with only one point of view character. There’s also specific expectations associated with Cozy mysteries—culinary mysteries are Cozies with a specific expectation in regard to story arc and character. I’ve had to learn about so many new things. AL: How do you go about approaching each new story to keep things fresh and interesting? JK: Panic and pray and write, write, write. I write, I cut, I write some more, cut some more, and eventually mold something new. I’m mindful of trying not to repeat plot lines, motives, twists, and character types which gets harder every time but so far is working out after much stress and many Coke slurpees. AL: With your Sadie mysteries, how do you come up with the type of murder and motivations each time? JK: I watch a lot of TV and movies. A LOT! 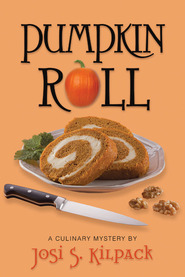 AL: What research did you have to do for Pumpkin Roll in particular? JK: I’d never been to Boston before, which made it intimidating to set a book there. I had hoped to go before my deadline, but that didn’t turn out, so I had to rely on friends, travel guides, websites, and movies and TV shows set in Boston—did I already mention I watch a lot of TV and movies? I also spent a lot of time researching ghost sightings and metaphysical beliefs and objects—lots of education there. JK: I fantasize about a schedule. *sigh* Alas, I am a frantic writer these days. I try to plug writing in anywhere I have room. My most effective writing these days is when I can leave my family in the hands of my husband and escape to the office building of our business. I try to do this once a week and write from about 5:00 p.m. 'til midnight. I can get a lot done, and if I know I have it scheduled that week, I don’t feel as neurotic about it. In addition to my writing, I have four kids and do the bookkeeping for our business. Life is chaotic. AL: Your career started out with a smaller niche publisher and has gone on to be with a much larger publisher and a successful series with a large fan base. What is one big thing you've learned throughout your career? JK: That you can never stop learning and growing. Not only within your writing, but in your own personal development. If you stop experiencing life, you’ll run out of ideas, and if you at any time think you know it all, prepare to be sideswiped with something that reminds you otherwise. Writing should be a part of your life that helps makes it better, and your life should be a part of your writing that makes it better too. Every goal you reach will lead to a new goal you’ll need to set. There will always be set backs, there will always be frustrations, but the pursuit has been a worthwhile one for me. AL: What's been the biggest surprise about the journey? JK: The amazing people I’ve met. I never imagined that there were as many neurotic people driven by the stories in their head :-) But my best friends are people I’ve met through my writing, and it has enriched my life more than the writing ever could. If someone would have told me that before I started, I wouldn’t have seen how the connections would happen, but they’ve become a priceless part of my journey, which just goes to show you that you’ll never know where your ambitions might take you. JK: Allow yourself failures and be honest in your evaluation of them. Find people who will tell you the truth and always look for ways to improve and grow your abilities. Keep perspective that writing should be a part of your life, but don’t stop living in the meantime. Surround yourself with inspiring people and things and work, work, work. In conjunction with the release of Pumpkin Roll, Josi and her publisher, Shadow Mountain, are sponsoring a contest for a new iPad. November 1, 2011. Winners will be announced and notified November 3, 2011. For additional ways to enter (and there are many), visit Josi's website. Get the book in paperback, audio, and Kindle formats HERE. 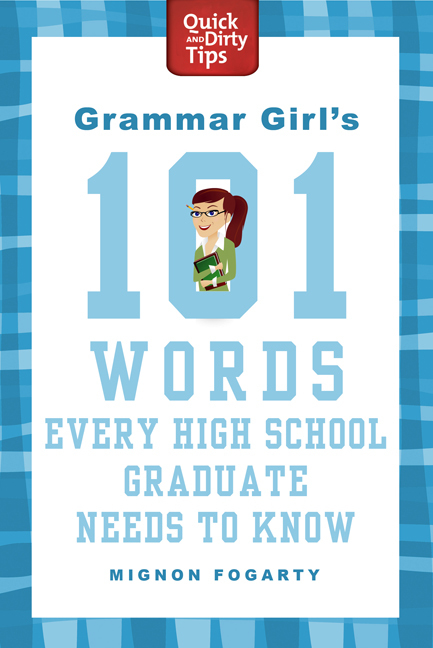 Today's Word Nerd Wednesday post isn't what I expected it to be. I had two of Grammar Girl's books. One was really short. Surely discussion on both books would fit into a single post, right? I jotted notes and thoughts on my bookmark (a business card). I didn't think I'd need more room than that. I did. Let's just say that I'll have to talk about the other book another time, because one post simply won't do them justice. 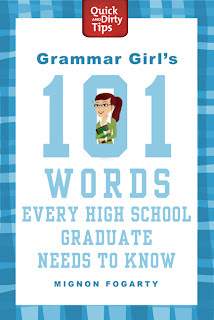 The words in this book aren't necessarily ones that high school grads will know if they did their homework. I've seen similar lists for high school grads, and they usually do include boring stuff like hypothesis that grads should know when they get a diploma. This one's different. If incoming college students knows these words, they'll be a step ahead in cultural literacy and understanding the world around them, whether it's the news, politics and what the politicians are saying (or calling each other), technology (important in today's world), science (ditto), or even pop culture. The book has a fun tone. It's a quick and easy read with lots of white space (easy on the eyes) and humorous drawings. The words are alphabetical, and every letter of the alphabet gets at least one. In the end, if you read the whole thing, you'll get more than 101 words, because several entries include opposites and related words. This is one I'll be keeping on my shelf. And making my teens read. *I received a copy of the book from the publisher. Opinions are entirely my own. I have standing policy of not reviewing books unless I have personally contacted the author with that intent.